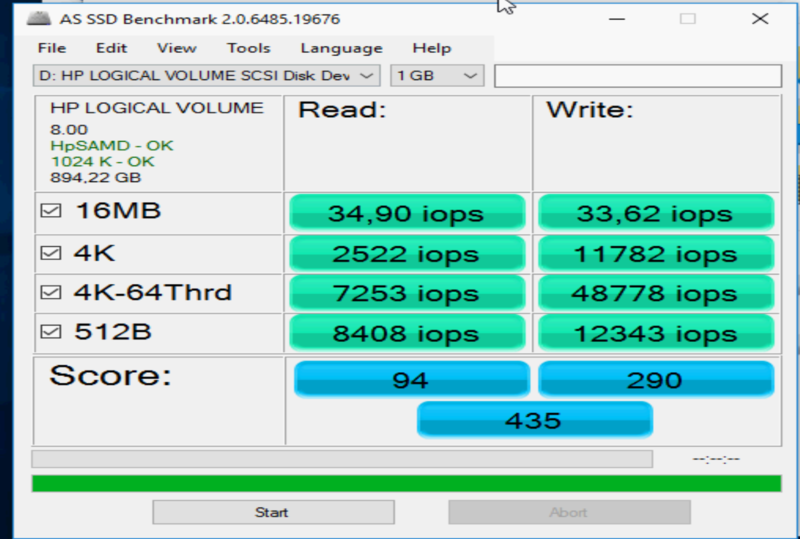 i have very bad read performance on my new intel ssd. HP proliant DL360e gen8 with Smart Array P222 controler. I have 2x HP SAS HDD 7200rpm(raid 0), 1x consumer Samsung SSD (raid 0) and 1x Intel s4500 (raid 0). Operating system is intalled on SAS drives (Windows server 2016). random read performance is low. Should be around 70 000 iops. Now 7253 iops. So cca 10x slower. Check the status of the "SSD Smart Path" settings on the controller. It's most likely enabled on your SSD "arrays". Disable it and try again. it helps, thank you. Now is it better. But i have another question. Supports smart array p222 in raid 1 something like simultaneously read data from two SSD? I cant find any info about it. Is your question "Can you have two SSD drives configured as a RAID1?" If so, the answer is yes. The RAID array can only be as big as your smallest SSD drive (sounds like you are using different size/model drives). RAID1 is probably not likely to help your read speeds and will possibly hurt your write speeds. RAID1 is "mirroring" so it's more of a data protection thing. However, RAID 10 (striping AND mirroring) is likely to help both performance and data protection goals but you'll need at least four disks. With SSDs, you'l likely eventually reach the point where a given controller cannot drive any more performance. So, at some points, additional SSDs will no longer help performance on that controller. However, you should still have room to grow.